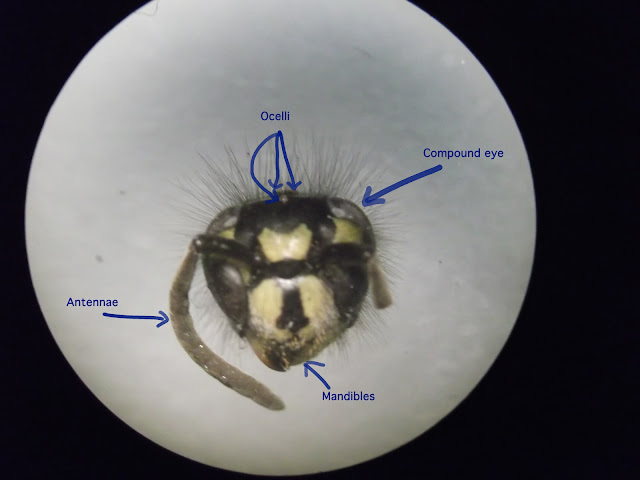 Suffolk Naturalist: Bad science, good science and ocelli. Some sources seem to theorise that the scales are predominately for defence and sexual purposes. Just looking at some butterflies such as this Peacock Inachis io below. 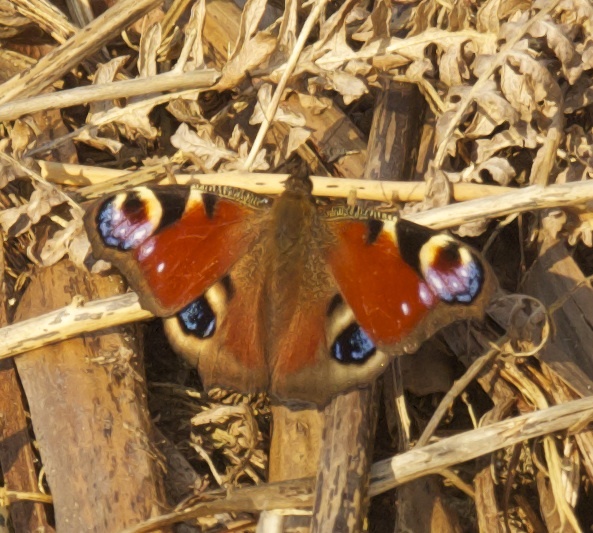 You will clearly see its fake eye spots, and when the butterfly feels threatened by a predator, it will flash these by closing and opening it wings rapidly and, in this particular species, it gives an audible squeak at the same time, thus emphasising the perceived threat to the predator. The bright colours also make it noticeable to a passing mate. As is often seen in nature, specimens often try to show off their colours in courtship displays. Colouration of scales also give the benefit of camouflage to hide from predators. This is specially helpful to moths who need to hide up in the daytime. Unfortunately, I don't have any pictures of moths in camouflage that I can show you. But hopefully this year, I'll get plenty that I can share with you and you'll get the idea. If you can't wait till then, type Buff tip moth into a google image search and you'll see a moth that resembles a small broken silver birch twig, it really is amazing! Peacock Inachis io butterfly taken last year clearly showing fake eye spots. Another theory on the use of scales was again as a defence mechanism and works on the idea that as the scales come off easily, when a moth/butterfly flies into a spiders web the scales that stick to the web come away from the moth allowing the moth ability to fly away at the cost of a few scales. Then came the idea that the scales were to aid flight by trapping dead air under the scale. This article was looking interesting until it made the following statement: "Scales in butterflies, typically, come in a variety of colors, while those of moths, as a rule, do not. This accounts for a basic difference between butterflies and moths. Butterflies tend to be gaudy, while moths, more often than not, are drab. There are exceptions to the rule, provided for instance by moths that fly by day and are colorful like butterflies, or that rest by day and depend on color for camouflage. But on the whole the difference holds." This statement more or less makes the whole article worthless. Is a baseless statement and no evidence is given to back up their claims. However, anyone who has trapped moths will know that the majority of moths are more colourful and more beautifully patterned than some butterflies. Always question what you read! The next theory was in complete contrast to the previous statement in that it was backed up with good hard science. The theory was that the scales help defend Lepidoptera, especially moths, by absorbing ultrasound from bats making it harder for bats to locate them. You can see the paper here and for those of you who haven't got time to read the whole thing (spoiler alert, look away now if you don't want to know the outcome), it turns out that of the species of moth and butterfly studied, moth scales did reflect weaker echoes than butterfly wings and with the scales removed, the wing absorbed less ultrasound, yet that did not happen in butterflies! This ultrasound absorption gave the moths 5-6% advantage in distance that a bat can detect them from. It may only seem a small advantage, but in the wild 5-6% can be the difference between life and death. So there you have it, there are some theories out there as to there use and I also believe their primary use is for defence whether it be mimicry, camouflage, spiders webs or ultrasound absorption. On the subject of moths. This morning I went down to the moth trap to find 0 moths again. Again, I didn't expect much as it had been raining during the day and the temperature was only a chilly 4ºC. Yet, when I checked my records from last year, I found that on the same date I had trapped 83 moths of 9 different species and the temperature was only 5ºC. So why the lack of moths??? As you can see from the above tables, the amount of moths recorded in 2012 are markedly contrast to 2013's records. Yet the temperature differences are not significantly different. Although I didn't take the temperature on 2/3/12, the met office website data states the mean for East Anglia was 3.5ºC, so it would be safe to assume that there were no temperature irregularities there either. A Twitter friend pointed out that maybe last years awful wet weather may have taken its toll on this years moths, and unfortunately, I believe she may be correct. All the rain would have meant that caterpillars wouldn't have been able to feed properly as they would have been washed off the leaves. The lower temperatures would have seen less breeding opportunities occurring, all significant factors. However, with a little digging, I've found some other interesting factor through local weather recorders. According to Phil Holmes weather page, the rainfall for February 2012 was 11.6mm. For the same month this year it's 33.2mm. That's three times as much and I feel could also play a significant part in the lack of moths so far. It would be interesting to find out other recorders findings to see what impacts they've recorded. Yes, I've been busy playing with the microscope again and looking at last years found dead bugs. 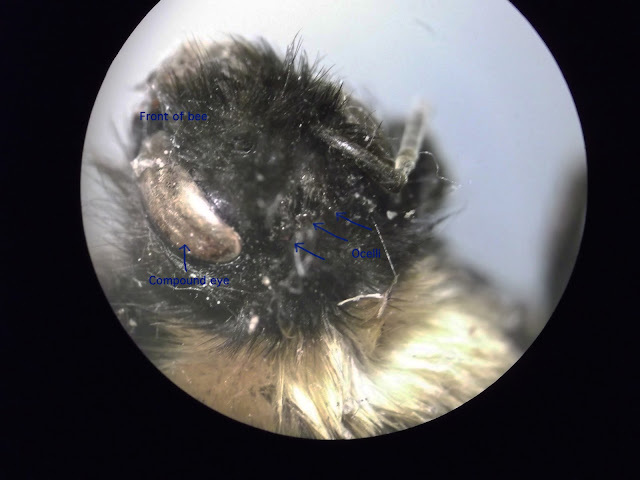 Last year I discovered a dead wasp and whilst looking at its head under the microscope I came across three little bumps on the top of its head in between its eyes. It turns out these are called 'ocelli' which basically means 'little eye' in latin. However, it's not an eye used for vision, oh no. It seems that it is used as a light receptor and aids navigation. The same wasp from the top. Wasps are not the only creature to have them either, I've also found them on the head of a bee, although I did have trouble getting a clear shot of these (Bees are hairy creatures as you can see). Taken from above the head, bee facing upwards. 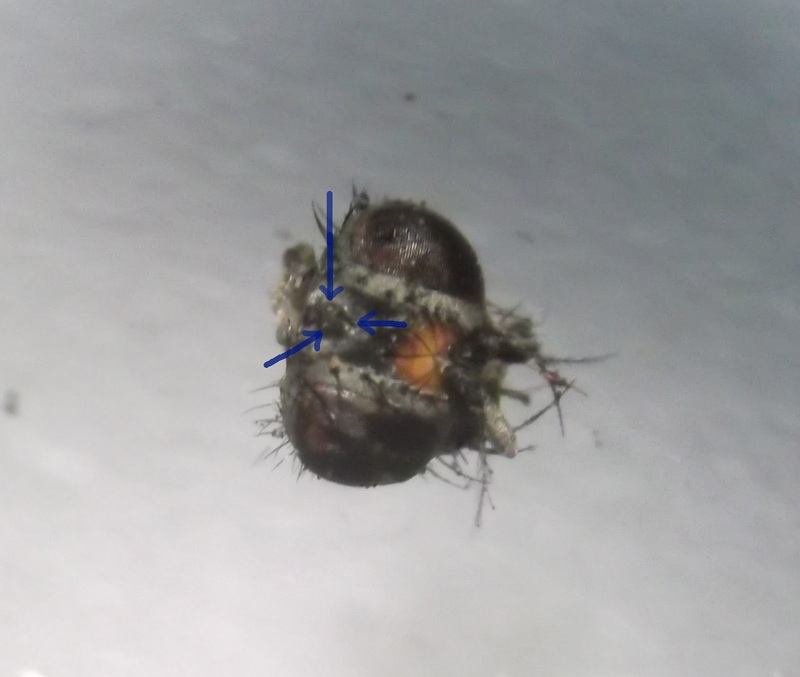 I've also found them on the top of a fly head. 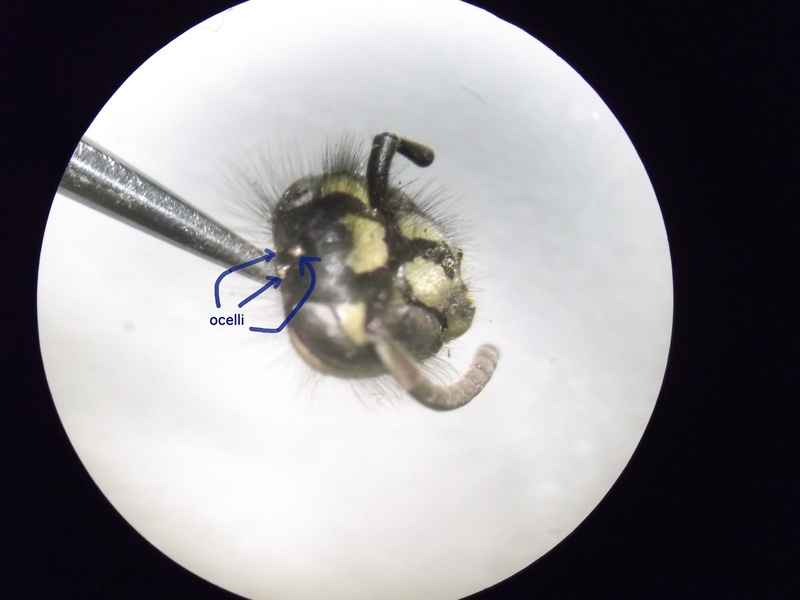 To give you an idea of scale, the fly's head is 2mm across, so the ocelli are extremely small. Although not a great shot, you can still see the ocelli arrowed. Again, I find this quite amazing that creatures so small have this built in GPS system that allows them to navigate by the position of the sun to help them find a little hole in the ground. Really is truely amazing. I've also found out that damselflies have them too, which look quite weird. If I come across a dead specimen, I will have a look and share my findings with you. I know, you can find pics of damselfly ocelli on the internet, but there's nothing quite like discovering for yourself either. Very informative Hawk. Even passed on interesting to facts to the other half! Keep up the good work!